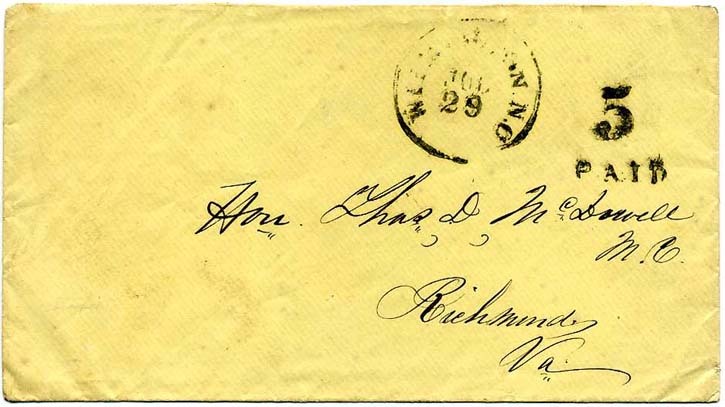 SALISBURY / N.C.  with matching handstamped PAID 5 on cover addressed to “Thos. W. Dewey, Esq., Cashier, Charlotte, N. C.” Dewey worked for the Bank of North Carolina, Fine. $130. 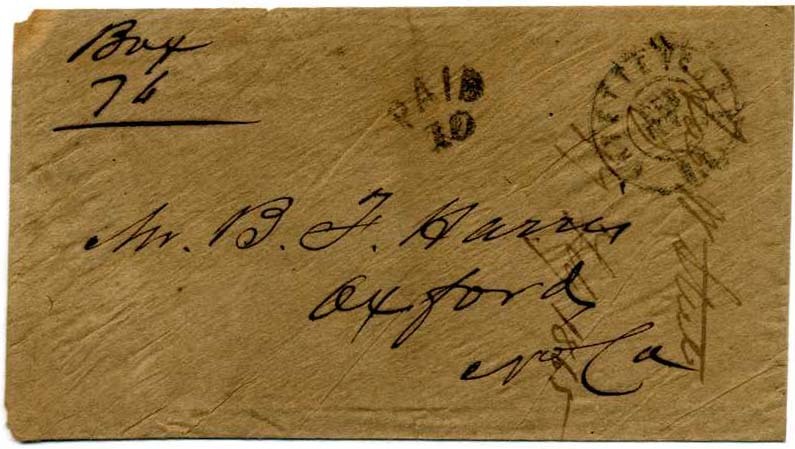 FAYETTEVILLE / N.C. // FEB / 17 double circle cancel with matching PAID 10 on homemade cover to B F. Harris, Oxford, No Ca with docketing indicating it was sent by Aug. W. Steel 17 Feb 1865, top back flap missing and slightly reduced at top, Very Fine. Late use. $200. 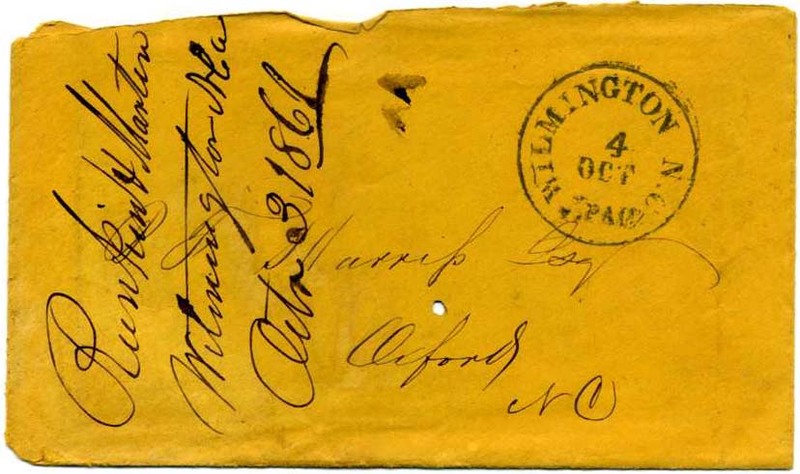 WILMINGTON / N.C. // 5 PAID // 4 / OCT  altered prewar integral PAID 3 postmark on cover to B. F. Harris, Oxford, N.C. with contents docketing up right side indicating it was from Runkin & Martin, Wilmington, N. Ca Octr 3, 1861; top back flap missing and top edge wear; vermin hole at center and in soiled original business enclosure as well. $125. HIGH POINT / N.C. // MAY / 13 balloon cds struck a bit high at left with matching PAID at right (no rate) on cover to Wm Fulford, Esq., Greensboro, No. Ca. $150. 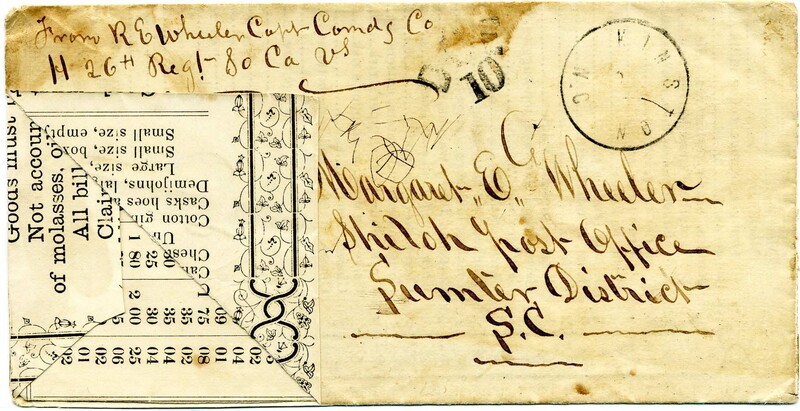 WILMINGTON N.C. // JUL / 29  cds with matching 5 PAID, CSA Catalog type A handstamp on stampless cover to Hon. Thos. D. McDowell M.C., Richmond, Va. Thomas David McDowell was a member of the Confederate Congress representing North Carolina. He was the owner of a 320 acre plantation and employed 57 slaves before the war. One idea he put before congress was that all Negroes captured from Union armies be sold and the proceeds distributed among the troops capturing them. $160. LENOIR / N.C. // JUN / 10 blue cds with matching blue PAID 5, CSA Catalog type C handstamp on clean homemade cover to W. W. Lenoir, Kitrels Spring, N. Ca. $225. 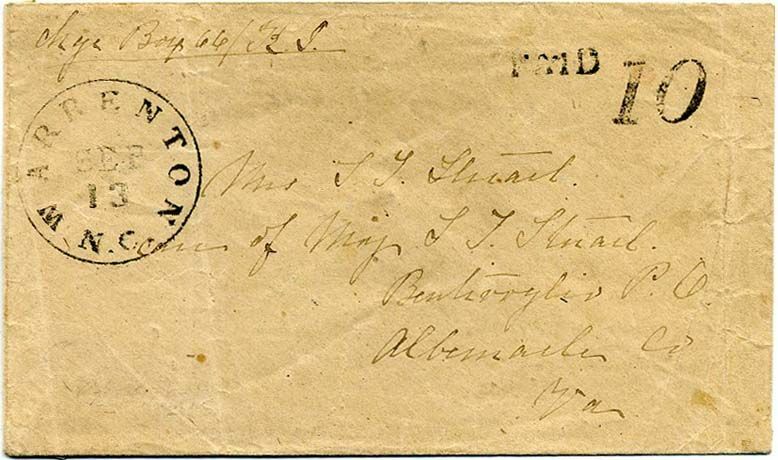 WARRENTON / N.C. // SEP / 13 cds with matching PAID 10 on a TURNED COVER to Mrs. S. T. Stuart Care of Maj. S. T. Stuart, Bentivoglio P.O., Albemarle Co, Va.; inside bearing a CSA 11 tied with manuscript cancel of Bentivoglio Va Sept 24, 1864. Most of one side flap missing. $250. 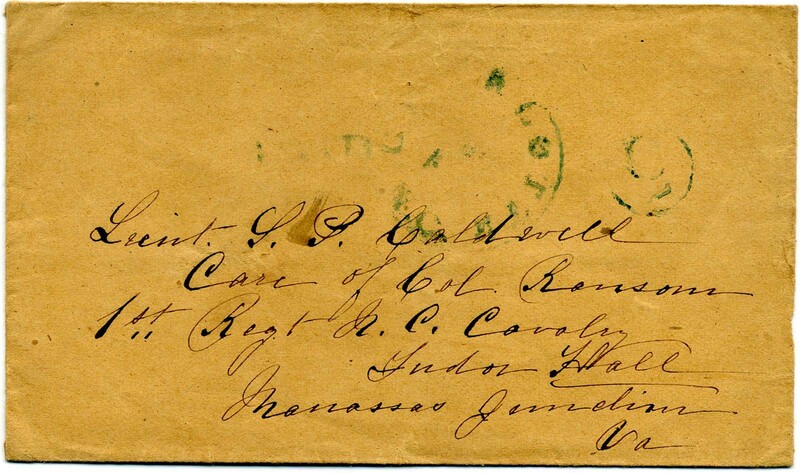 GREENSBOROUGH / N.C. // OCT / 3 / 1861 blue cds with matching 5 PAID, CSA Catalog type B, to J.A. 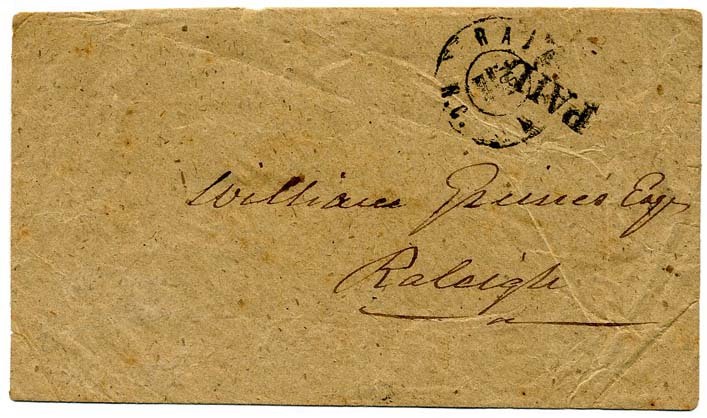 Janratt, Huntsville, N.C., slightly reduced at top with back flap missing, Very Fine, CCV $200. $190. 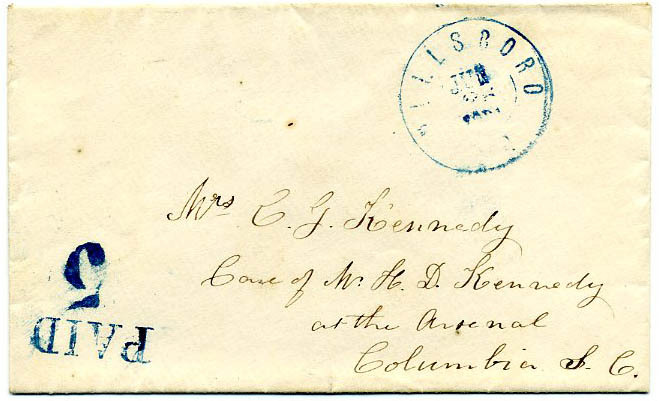 HILLSBORO / N.C. // JUN / 26 / 1861 dcds in blue with matching PAID 5, CSA Catalog type A, on small pristine pink lined commercially made cover to Mrs. C. G. Kennedy, Care of Mr H. D. Kennedy at the Arsenal, Columbia, SC; Palmetto Iron Works and Armory stood nearby the Arsenal. Upper left corner could be turned to display the pink inside, flap opening tear. $200. STATESVILLE / N.C. // FEB / 10 bold cds on homemade cover to Mr. A. B. Y. Guither, Houstonsville, Iredell County, N.C. with manuscript “Due 10” and endorsement of Private M. Campbell, Co. H, 4th N.C. S.T. (North Carolina State Troops). 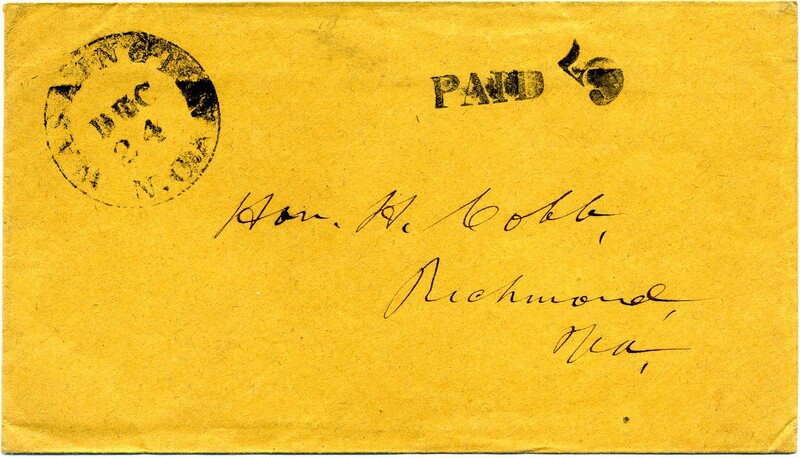 Evidence of prior stamp at upper right. At the Battle of Seven Pines, the 4th NC regiment (aka as the Fourth North) justly earned its sobriquet of the“Bloody Fourth.” The regiment was commanded by Lt. Col. Bryan Grimes, who led the charge, and was the only officer who survived the fight unwounded. The 4th went into battle with 520 men and 25 officers - “the noble 545.” In carrying the works, it lost 462 men and 24 officers killed and wounded; this was the bloodiest charge of the war. 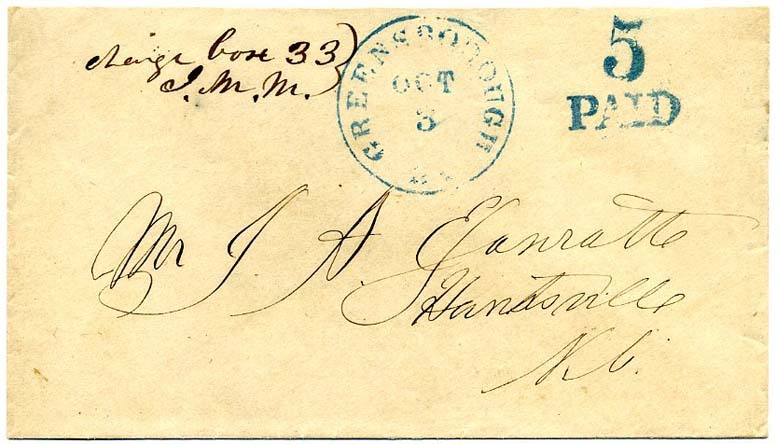 This combination of postal markings not listed in the CSA Catalog. $220. 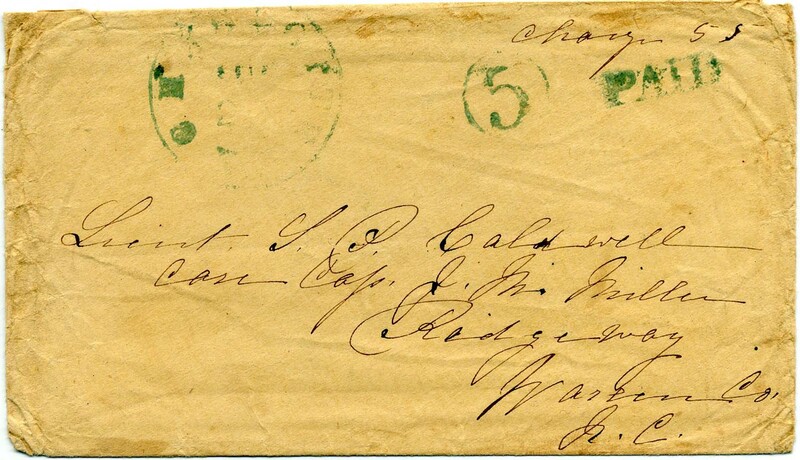 WASHINGTON / N.C. // DEC / 24 / 1861 cds with matching PAID 5 (CSA Catalog Type A, CV $200) on clean cover to Hon. H. Cobb, Richmond, Va. $150. Thomas Howell Cobb was a Southern Democrat and prominent politician in both the US and CSA as well as Major General in the Army of Northern Virginia. Much more information on linked page. CHARLOTTE / N.C. // DEC / 23  blue cds with matching PAID 5 (CSA catalog Type D, CV $250) on narrow commercially made stampless cover to “Lieut S. P. Caldwell, Care of Col. Ransom, 1st Regt of Cavalry N.C. 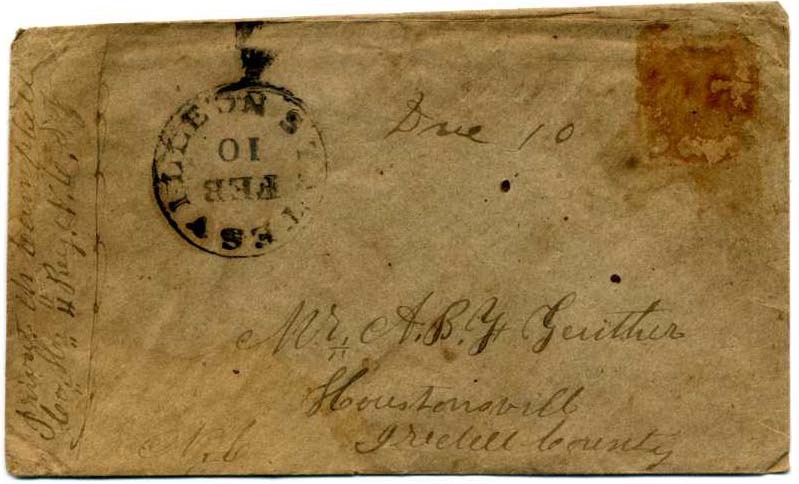 Vol., Tudor Hall, Manassas Junction, Va.” Missing top back flap. $200. Samuel P. Caldwell enlisted as a 2nd Lieut. on 5-16-1861 in Co. C, NC 1st Cavalry, promoted a few months later to 1st Lieut. and transferred to Co. D.
CHARLOTTE / N.C. blue cds with matching PAID 5 (CSA catalog Type D, CV $250) on commercially made cover to “Lieut S. P. Caldwell, Care of Cap. 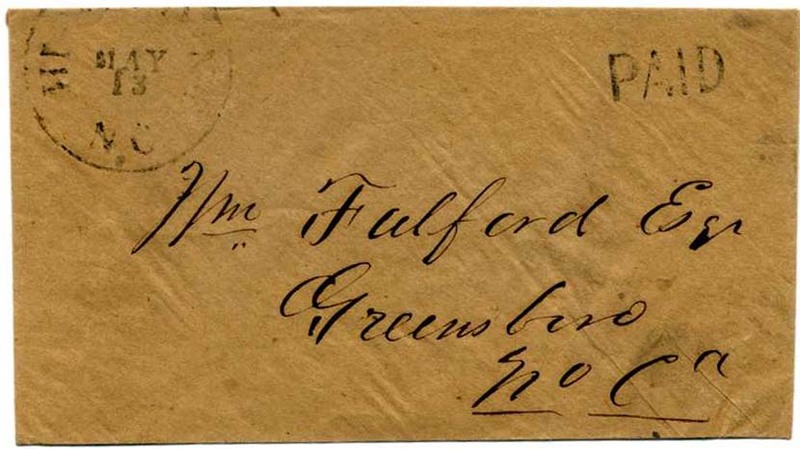 J. M. Miller, Ridgeway, Warren Co. N.C.” Missing top back flap. $150. CHARLOTTE / N.C. blue cds with matching PAID 5 (CSA catalog Type D, CV $250) on commercially made stampless cover to “Lieut S. P. Caldwell, Care of Col. Ransom, 1st Regt of Cavalry N.C. Vol., Tudor Hall, Manassas Junction, Va.” $150. 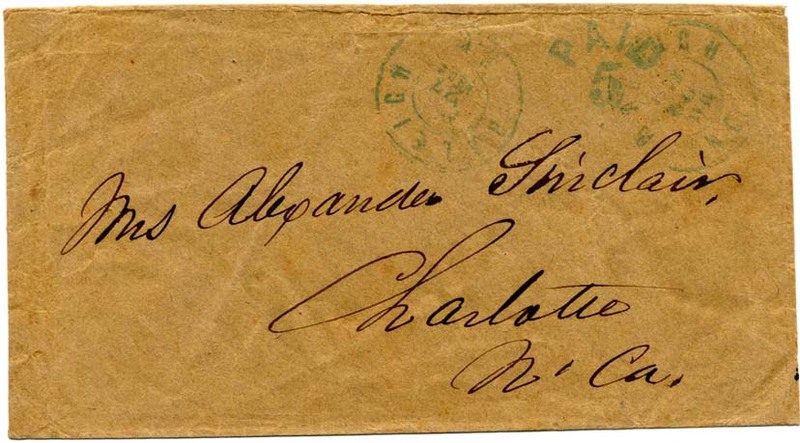 SALISBURY / N.C. // AUG / 7 /  with bold matching boxed PAID 5 (CSA catalog Type B, CCV $200) on stampless cover from Lieut. S. P. Caldwell, Care of Col. Ransom, 1st Regt of Cavalry N.C. 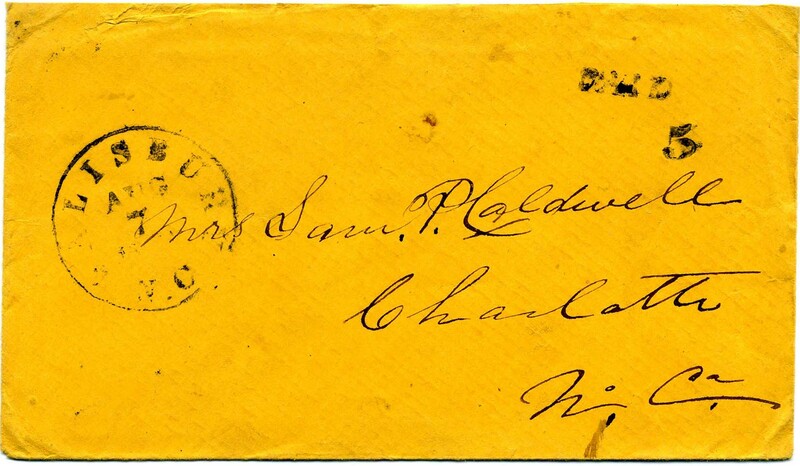 Vol., (no soldier endorsement as it was paid in advance), to Mrs. Sam P. Caldwell, Charlotte, No. Ca. Flap missing and slight edge wear. $150. 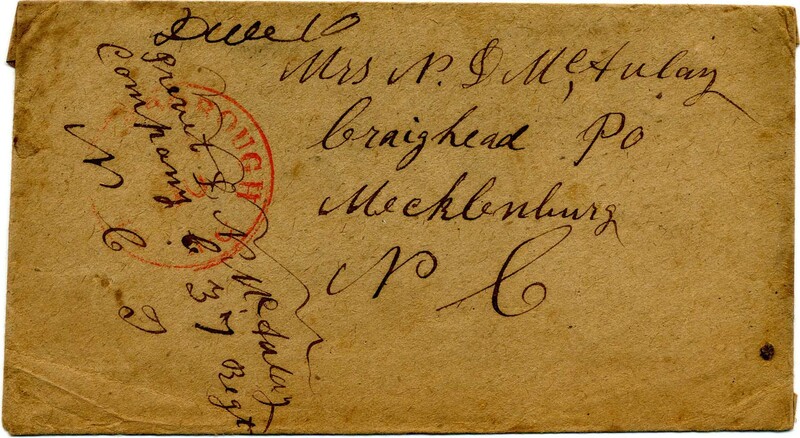 GREENSBOROUGH / N.C. red cds with ms. “Due 10” on soldier’s cover to Mrs. N. P. McAulay, Craighead PO, Mecklenburg, N, with endorsement of “Privet D. N. McAulay, Company C 37 Ret NCT” (North Carolina Troops). Two page letter to his mother, headed Camp Stokes October 29. He is horrified by the language used in camp, “I have now been turned over to the 37th Regiment and expect to start for Richmond this night. I have heard such swearing since I have left home since I got married. 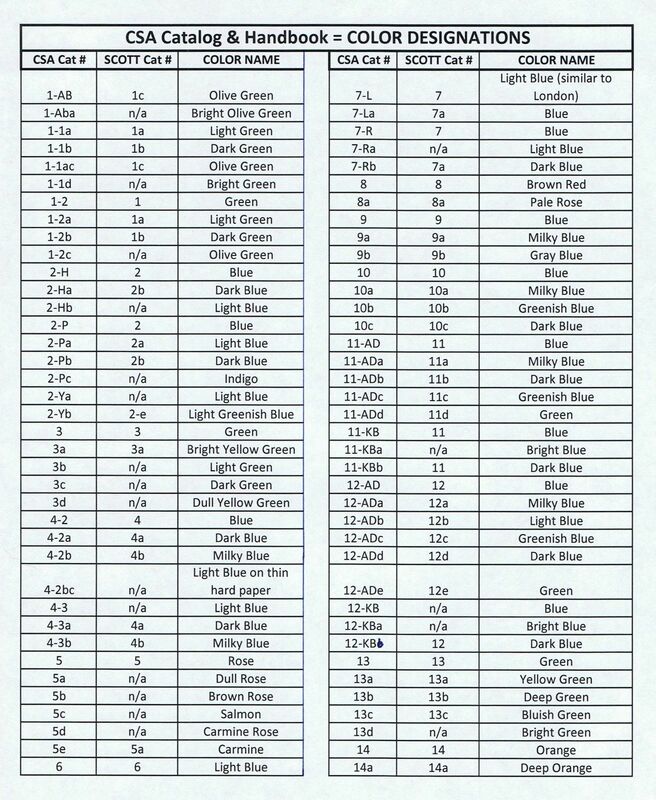 We have loud praying and awful cursing with 15 steps of our tent at the same time, there can be no peace for such people, no, never, never. Just one week ago I left my own sweet home, I only stopped three nights. One night l on a sack or corn in the depot at Charlotte, then I came 110 miles to Greensboro, I have laid 3 nights in a tent and this night I expect to start for Richmond. The Lord only knows what will become of us! I remember now to ask all of you to remember me in your prayers for I may be shot. When the train got here a preacher came into the cars and passed through giving each man a nice little tract [religious pamphlet] to read. One wretched wicked man cursed him and told him to keep his wicked paper. When I see how wicked the some people are here I feel like…I would rather be a doorkeeper in the house of my God then dwell in the tents of those wicked” Daniel N. McAuley.” Letters on linked page. $280. Daniel N. McAuley mustered into "C" Co. NC 37th Infantry 10/25/1864. He died of disease on 2/22/1865 after serving in the Petersburg siege. CAMP STOKES near Greensboro, was initially a Confederate camp of instruction for conscripts and later as a prison for deserters 1864-1865. When the war ended, 200 Union prisoners were held here. 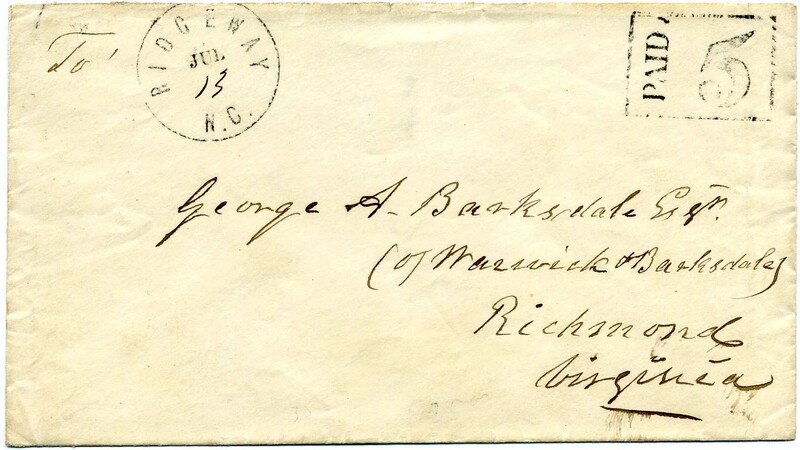 Camp Stokes was commanded by Major Jesse R. McLean of Greensboro, N.C.
RIDGEWAY / N.C. // JUL / 13 (ms)  with matching large fancy boxed PAID 5 (CSA catalog type B, CCV $300) on cover to George A. Barksdale, (of Warwick & Barksdale), Richmond, Virginia. Top back flap missing otherwise Extremely Fine, Ex Emerson. $300. 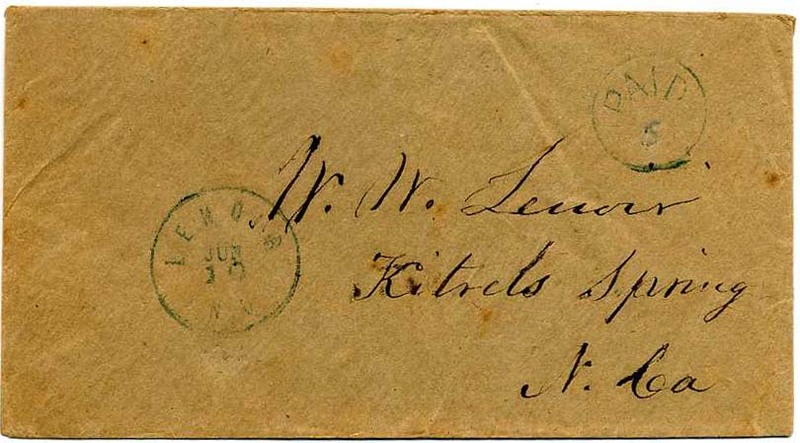 KINSTON, NC, cds with matching DUE 10 on soldier’s cover endorsed “From R. E. Wheeler Capt. 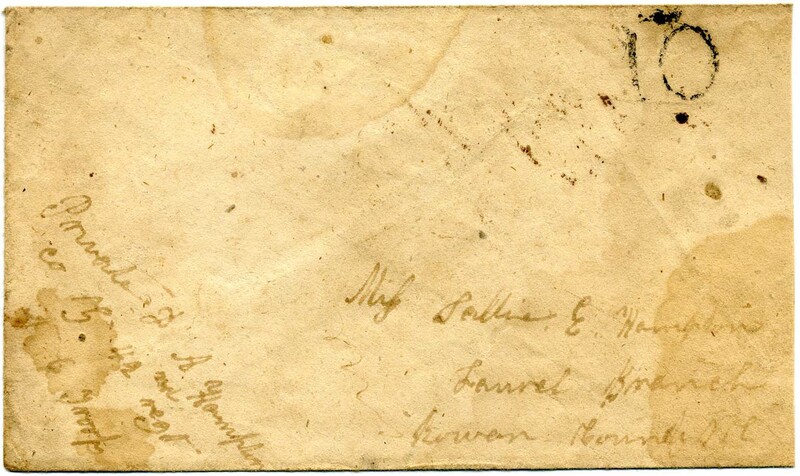 Comdg Co H 26th Regt So Ca Vs:” to his wife “Margaret E. Wheeler, Shiloh Post Office, Sumter District SC.” Adversity cover fashioned from fancy list of goods; fully exploded and shows well from either side, light staining at upper left. $230. Robert E. Wheeler served as a captain commanding Co. H, Regt South Carolina Infantry, Evan’s Brigade, Johnson’s Division, Beauregard’s Corps, Army S.V. & N.C. Much more information on linked page. [WILMINGTON / NC // DUE] 10 neatly struck on homemade cover to Miss Sallie E. Hampton, Laurel Branch, Rowan County, N.C. Enclosed “Private D. A. Hampton, Co. G, 42nd Regt N.C. Troops.” Light water stains and slight reduction at right. 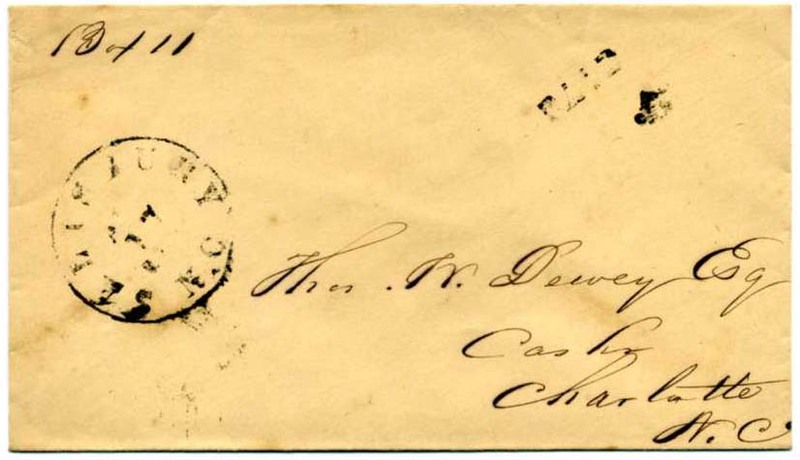 Per Stefan Jaronski, this Wilmington numeral-only marking without the postmark was used from 1864 forward on soldiers’ due mail processed to / from soldiers in the area by the Wilmington post office. $200. David A. Hampton served in Co. G, NC 42nd Infantry, Kirkland’s Brigade, Hoke’s Division, 1st Corps, Army of Tennessee iand, Army of Northern Virginia 4th Corps. Much more information on linked page.